Big Bend Country is a triangle-shaped region in west Texas formed where the Rio Grande River runs southeast, then northeast, in a large loop. 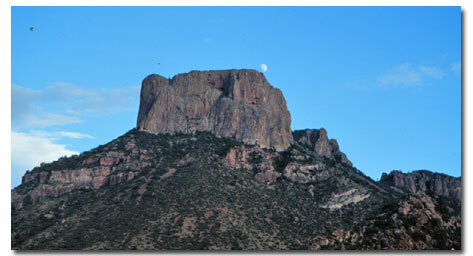 Big Bend National Park is located at the elbow of the bulge, comprising a much smaller portion of this region. Together with this river, 300 million years of climatic and geologic change accounts for the unusual topography and beauty of Big Bend National Park. Ten thousand years ago, ice-age peoples lived in the Big Bend region hunting elephants, camel, horses and bison. As the glaciers receded and the climate became drier, they were replaced by hunter-gather Indians of the Desert Archaic culture Their descendants, became sedentary farmers setting into villages around 1200. The Chisos, who later supplemented seasonal crop gathering with hunting and gathering, inhabited the area until early historic times until being replaced by marauding Mescalero Apaches in the 1700s. Spanish exploration of the area began with Coronado's expedition in 1542, but the expected riches north of the Rio Grande were never found. Presidios were later built nearby, in what was then northern Mexico, in unsuccessful attempts to protect the region from Apache raids. After acquiring a vast new territory from Mexico in 1848, which included Texas, the United States built nearby Fort Davis and other Southwestern forts to protect settlers and travelers from Apache and Comanche raids. When peace treaties were signed in 1886, mining activities began shortly thereafter, primarily quicksilver. Before long, farmers migrated to the fertile Rio Grande floodplain became an agricultural center. In the 1920s and 30s, cattle grazing became the primary industry in the region, but overgrazing resulted in destruction of desert grasslands and wildlife dependent upon them. After becoming a national park in 1944, restoration of the gradual grasslands has occurred, but protection of the habitat for the appx. 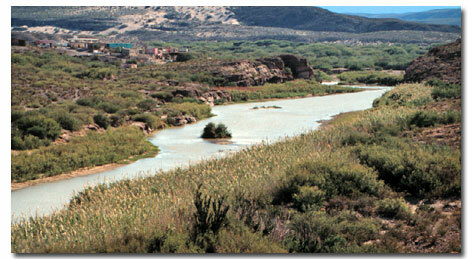 5,000 plants and animals of the Big Bend area remains a top priority. Designated an International Biosphere Reserve, 1976. Although the Chihuahuan Desert is hot and dry, 5,000 species of plants and animals inhabit the region at various elevations from 1,800 to 4,500 feet. Coyotes, Kit Foxes, Peccaries, Jackrabbits and snakes all hunt at night, but the Coachwhip Snake, Kangaroo Rat and Earless Lizard might be seen during the day. More than 434 species of birds have been identified within Big Bend, including the Summer Tanagers, Bell Vireos, Painted Buntings and Vermillion Flycatchers. The rare Peregrine Falcon, Golden Eagle and Colimba Warbler also call Big Bend home, as well as White-tailed Deer, Mexican Black Bear, Mountain Lions, beavers, turtles and a number of rare fish species. Forests of Yellow Pine, Bigtooth Maple and Arizona Cypress cover the Camen Mountains.Many species of cactus grow in Big Bend, as well as Candelilla, Ocotillo, Creosote, Chisos Agaves along with a number of yuccas, most noticeably the Dagger Yucca. Wildflowers such as Texas Bluebonnets, Narrow-leaf Globe mallow and Prickly Poppy bloom into late spring. There is an incredible variety of geologic activity displayed in Big Bend National Park, from uplifted limestone in the Sierra del Carmen range, thick mud shales at Hot Springs, and volcanic craters of the Chisos Mountains, to dinosaur remains near the park's Maverick entrance. Primary geologic features of Big Bend can be seen where the Rio Grande River has cut three great canyons through geologic structures that have produced mountains. Boquillas Canyon, the longest canyon in the southeastern part of the park, cuts across the uplifted Sierra del Carmen range. Upstream at the park's southern tip, Mariscal Canyon is formed where the river crosses the structure of Mariscal Mountain. Upriver at the park's western end, spectacular Santa Elena Canyon was cut by the Rio Grande during uplift of the Mesa de Anguilla, a fault-block mountain. The principal bedrock of all these mountains is folded and faulted Cretaceous limestone. The volcanic and plutonic rocks that make up the rugged Chisos Mountains, reaching 1,000 feet higher, stand in stark contrast. The youngest bedrock in the park, they were created by igneous emplacements and extrusions during the Oligocene.